As stated in our last blog entry, Jackie and I had every intention of spending time each day of our week’s vacation in St. Martin preparing for our Camino. Walk the beach, drink some wine, talk to the locals–those are apparently the big three components of the Camino. We managed two of the three components every day. We have the wine part down pat—we’re naturals. We also spent lots of time meeting and enjoying new people. But, the walking suffered a little–actually a lot. The first day, we managed one dedicated walk of nearly three miles covering Orient Beach each direction. The rest of the days, we just thought about walking. Our days, for the most part, were spent sitting on beach chairs directly in front of Kakao Beach Bar on Orient Beach watching the waves roll in, spraying tanning lotion, and people watching. But, we had a great surprise on our last afternoon on the beach. A young couple was enjoying their day on the beach, and asked Jackie to take a picture of them together with the beautiful beach as the background. As the introductions were made, Jackie learned that they were both University of Michigan Law School grads, currently living and working as attorneys in Florida. My daughter, Nicole, is a University of Michigan grad. Being the conversation specialist, Jackie learned that Victor and Sharon Bayata (the young couple) were considering a move to Wyoming, the state where Jackie’s son, Aaron, lives with his wife and daughter. Victor, it seems, is the son of two Italians, who grew up in Mexico. His family includes siblings in the United States and Spain. “Have you heard of the Camino?” Jackie asked Victor. And the gates were opened. Victor not only had heard of the Camino, he had walked it when he was 19 years old with a dear man, Roberto, who was then 65. Victor recalled Roberto as his father like-mentor. His love for Roberto was obvious and deep. We were very intrigued with Victor’s experience, and his recollection of the trip and its meaning to him brought real tears to our eyes, and his. Tears of joy and emotion are the rewards of the Camino. Victor explained that Roberto had talked him into the pilgrimage and that their time together during that trip was important to them both. He remembered the agony of the daily walking–the hills and the beauty of northern Spain. Victor’s eyes lit up as he talked about how it had changed him as a man, and how he hoped to someday take his wife on the Camino. He knew the Camino had molded him in ways he could not describe. “I am a better man because of the Camino,” he said. His words were heartfelt. Then he emotionally choked up while describing the final ten meters at the Cathedral de Santiago de Compostella where Roberto, at the end of their 500 mile walk, dropped to his knees to cover the final meters on his knees. Unfortunately, Roberto died in an accident two years later. His statement from the end of his Camino was included in his obituary. We were all teary-eyed as we ended the conversation—Jackie, I, Victor and Sharon. It was an amazing moment on a beautiful beach in the Caribbean. And while it meant a lot of Jackie and I to hear his experience, Jackie is certain the moment was most important to him. We loved it. Victor Bayata, wasn’t the only cool character we met on the trip, however. 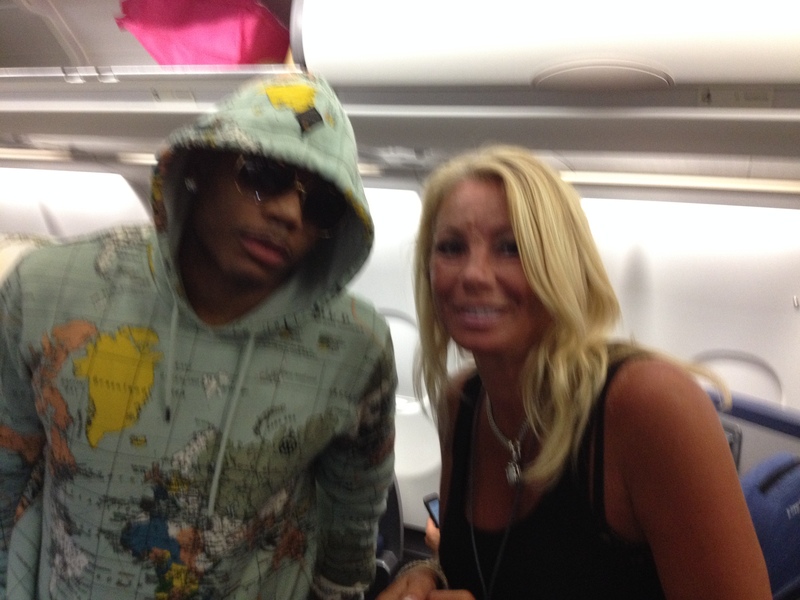 Nelly, the hip hop star, was stationed in the row of seats directly in front of Jackie on our flight to Charlotte from St. Martin. I found photos on-line today where Nelly was enjoying a private villa somewhere on the island last week. He was very friendly to us, and allowed Jackie to get a photo with him as he entered his “baller-mode”—-no kidding, those were his words—note the hoodie and sunglasses in the photo. Needless to say, we didn’t discuss the Camino with Nelly. His huge bodyguard would have had to stay up all night to guard Nelly’s ten carat diamond earrings at night in the alburgue—the dorms where pilgrims stay on the Camino.